Choose your canvas format and size from the ‘Styles & Sizes’ Menu. Photos are uploaded on the canvas product page where you can also select your required options. If you require multiple copies of the same image you can let us know in the notes and select the number of items in the appropriate field. If you’d like several different prints done at the same size and options, you can upload up to two images on the canvas product page and select the number of items in the appropriate field. Let us know details in the “Notes about your image(s) or order” field. Alternatively (and for more than two images), upload one image, click on ‘add to cart’ and on the next page choose the ‘Continue Shopping’ link. We check your image(s) and will contact you if we have any concerns regarding the image quality or if the image suits the frame size you have chosen. Your image is then printed. We also apply a protective UV varnish over the print. Stretcher bars are selected and assembled into the correct size frame. The printed canvas and assembled stretcher bars are bought together using a specially made stretching machine. This machine enables us to get an accurate stretch and tension in the canvas before fastening to the frame. Excess canvas is trimmed off and picture tape is applied to the back of the canvas. The finished canvas print is quality checked. Finished canvases are bagged, bubble wrapped, then packaged in cardboard ready for shipping via courier. 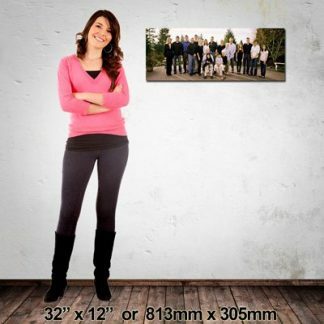 The canvas arrives at your home, or we ship directly to an alternative address of your choice. All that is left to do is decide were to hang your new artwork and enjoy it.